Friedrich von Boetticher was Germany's only military attaché accredited to the United States between the world wars. 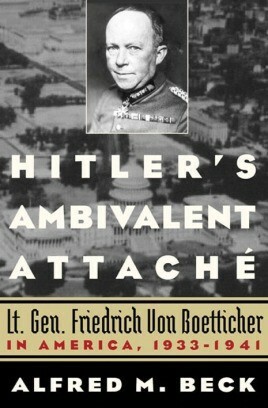 Unfortunately, due to sales rights restrictions, we cannot offer Hitler's Ambivalent Attaché for sale in your country. A loyal German, von Boetticher had strong ties to America. His mother was American-born, he spoke English fluently, and he was enamored of American military history. He was also anti-Semitic and believed that"Jewish wire-pullers” had undue influence over the U.S. government and its policies. His professional ties to U.S. Army officers in the War Department were so strong—supplying them, for example, with details on German air strength and operations during the Battle of Britain in 1940—that they survived until August 1941 and long after the German ambassador himself had been recalled. Torn between his duty to Germany (though the Nazi regime had attempted to harm his son) and his deep affection for America, von Boetticher stood among the broad middle range of German officials who were neither perpetrator nor victim.